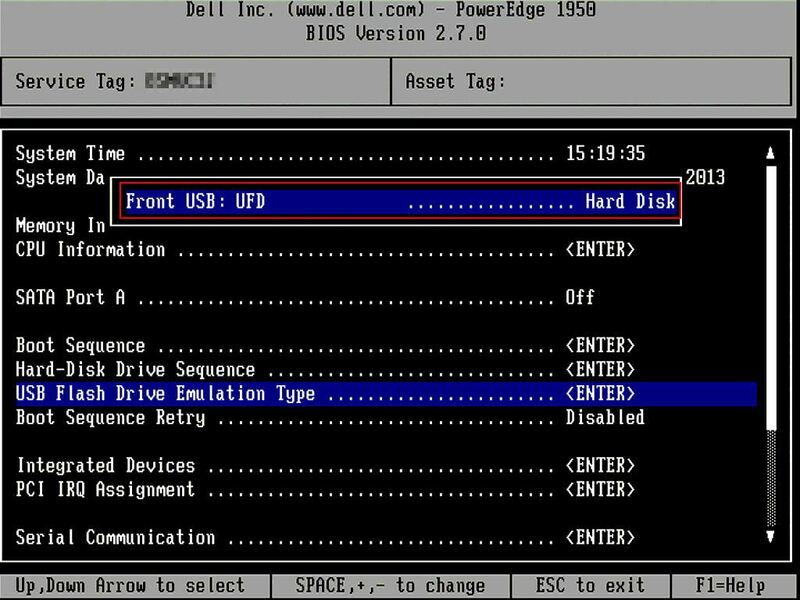 As part of my evaluation of Windows Server 2012 I needed to install the operating system on an old Dell PowerEdge 1950. As this server is old I decided not to use the Dell System Build and Update Utility DVD and instead chose to install Windows from a USB flash drive as it’s much faster than using a DVD. In order to install from USB, obtain an ISO file containing the Windows installation files. Next, download and install the Windows 7 USB/DVD tool http://www.microsoftstore.com/store/msusa/html/pbPage.Help_Win7_usbdvd_dwnTool . Start the tool and follow the wizard to extract the ISO files onto a USB drive of 4GB or greater and make the USB drive bootable. When starting the server I selected the BIOS boot order and selected the USB flash drive, but received a boot error. In order to enable USB boot, enter the BIOS and change the USB Flash Drive Emulation Type to Hard Drive. Reboot and USB boot will work. This entry was posted in Hardware on June 25, 2013 by richardstk.